This photograph is of the eighth grade graduating class of Gray County Schools in Cimarron, Kansas. 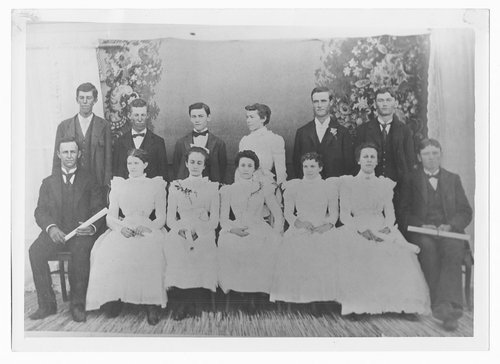 The photograph is taken at the Methodist Episcopal Church in Cimarron on July 21, 1899. The students are listed from back to front, left to right as follows: Roscoe Good, Alvin Good, Forrest Luther, Lena Steinkuehler Mackey, Clarence Francisco, Claud Hammer, Crawford Whiteside, Ella Elem, Julia Slaughter, Mabel Shoup, Loy Harvey, Della Burns and Clyde Hammer.